A very interesting pre-wedding photo of a Nigerian couple has emerged online and it has got a lot of people talking. In the photo the bride was spotted doing a work that is meant for her man and a lot of feminist are not happy about this. 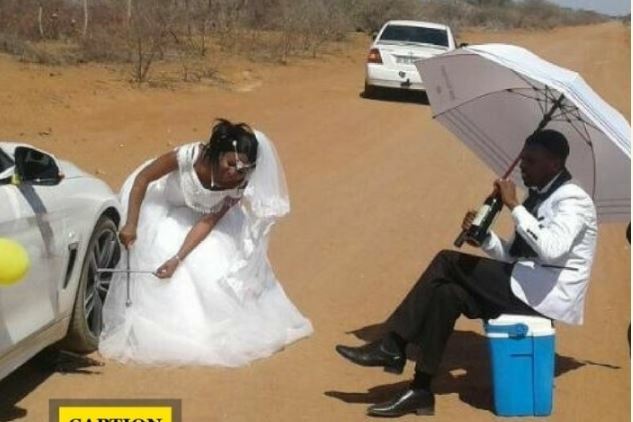 Judging from what we are seeing in the photo, it appear the couple’s car got spoilt on the road and instead of the husband taking care of the mess, it was the bride doing all the struggle and the guy was just there relaxing. Previous articleStunning Photos From Mairama Indimi’s White Wedding Emerges Online! From Friend Zone To Marriage Zone, Princewill Is Set To Put A Ring On It!